By now, you’ve probably heard of the growing blockchain and cryptocurrency sector and you’re probably wondering how to get blockchain jobs. It seems to have turned the world upside down. As Bitcoin peaked at a price past $20,000 in late 2017, a mad fever seemed to descend on the whole technology industry. With both Bitcoin and Ethereum pushing the sector forward with large partnerships, institutional money flowing in, and a wave of technical advancements, the sector is maturing. That brings entrepreneurial talent and demand for new hires. New projects are now creating their own tokens to be able to raise money and hire teams to execute on their product roadmap. Now is a good time to examine blockchain jobs. Before we get started, we have to define a few terms. Blockchains are distributed blocks of data linked together by a specific set of consensus protocols, while cryptocurrencies are the tokens used to access services and applications built on the blockchains in questions. For example, you use the Ether token to access services on the Ethereum blockchain. You can trade in tokens so they may increase or decrease in price as a function of the overall health of the blockchain they access. In practice, a cryptocurrency startup will be focused on the value of the token and any underlying application and blockchain they build on top, while a blockchain startup will be focused on building or maintaining blockchains while not necessarily taking advantage of tokens for internal compensation or for fundraising. This will matter when it comes to compensation, with blockchain startups geared towards conventional salaries and cryptocurrency startups offering slightly higher pay, and token grants to incentivize employees. There is a difference between blockchains and cryptocurrencies after all. Are there new blockchain and cryptocurrency jobs? What are the types of companies building products in the space? Most blockchain and cryptocurrency startups have the same demands for different roles as your standard startup. Web development, product and design needs in blockchain and cryptocurrency are as strong as they are in any regular startup. There are now thousands of open job roles with different blockchain/cryptocurrency startups hosted on popular startups job site AngelList. Consultancy firms working in the space have flagged a talent gap. Deloitte alone is looking to hire about 25,000 people who are familiar with the blockchain space. Developers can command salaries of over $220,000 USD. There are currently 401 blockchain and cryptocurrency startups (as of July, 30th, 2018) hiring for full-time roles above $100k USD in compensation on popular startups site AngelList. Using the same search approach, about 800 cryptocurrency and blockchain startups are currently hiring for different roles. A quick look at CoinMarketCap shows there’s about $200bn in market value in cryptocurrency as of August 2018. There are about 2,000 cryptocurrencies listed, many of them supported by a core company. About half of all blockchain and cryptocurrency startups on AngelList have tagged themselves as being open to remote job roles. This compares with the 30% average on AngelList of all companies that are open to remote roles. Cryptocurrency and blockchain startups are on average almost twice as likely as your standard tech startup to accept distributed team members and remote job roles. There are also some freelance roles in cryptocurrency and blockchains, with many workers in the space listed on platforms like Upwork. There are, as of August 2018, about 1000 freelancers listed with blockchain as a term. In comparison to more established careers such as web development and data science, there are less absolute jobs. However, the sector and the jobs attached to it are growing rapidly. Blockchain developers in the United States earn about $130,000 USD according to ComputerWorld. This is a bit higher than the average for programmers everywhere at $105,000. Freelance rates for different cryptocurrency functions can be higher than $150 USD per hour. Increasing numbers of cryptocurrency and blockchain startups use their own cryptocurrency tokens to compensate employees. Think of these as more liquid versions of startup shares, with more liquid markets where you can sell your tokens at different prices. You might want to choose the sector and get interested in blockchain jobs because it’s growing and there’s higher compensation. You might also choose it because you want to upend traditional hierarchies. The number of blockchain jobs and crypto jobs posted on AngelList, a popular startups job resource, nearly quadrupled between 2016 and 2017. There are three main reasons to join the sector. You want higher-than-average compensation that is more liquid (albeit with quite some risk). You want a flexible/distributed relationship with your work. There is a need for designers throughout a crypto startup. They help with making any project look good with a consistent brand identity. They can ensure a great user experience and help the adoption curve of new crypto products come off flawlessly. 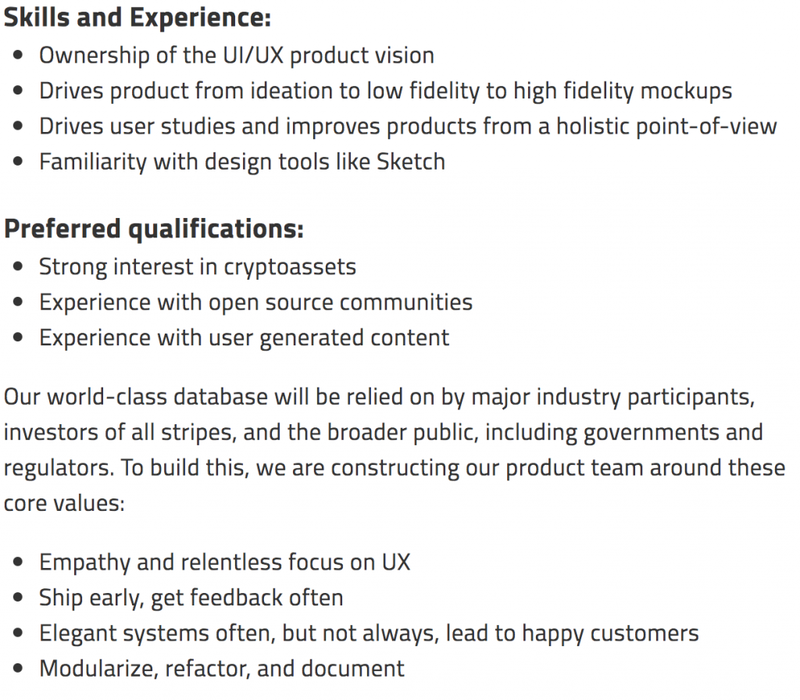 This job description from Crypto Jobs List and Messari help shows what a designer role at a crypto startup looks like. There different types of software developers in crypto-land. You have the same web development needs as any tech startup would have. You also have a demand for people who are familiar with how to build blockchains or create smart contracts. These demands are often separated. You have developers focused on on-chain work that is more related to the blockchain and its specifics. You also have off-chain developers focused on standard web development tasks. The above is from a job posting for a blockchain engineer. 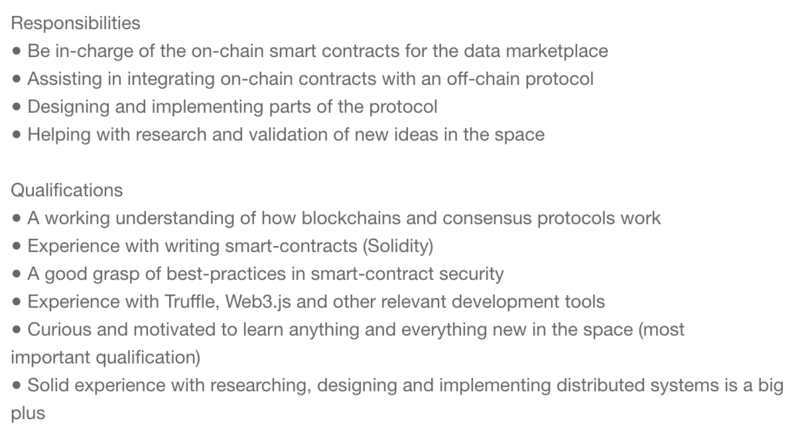 The focus is on Solidity development and on-chain work and writing smart contracts. Tools such as Truffle and Web3.js that are specific to the Solidity environment come into play. 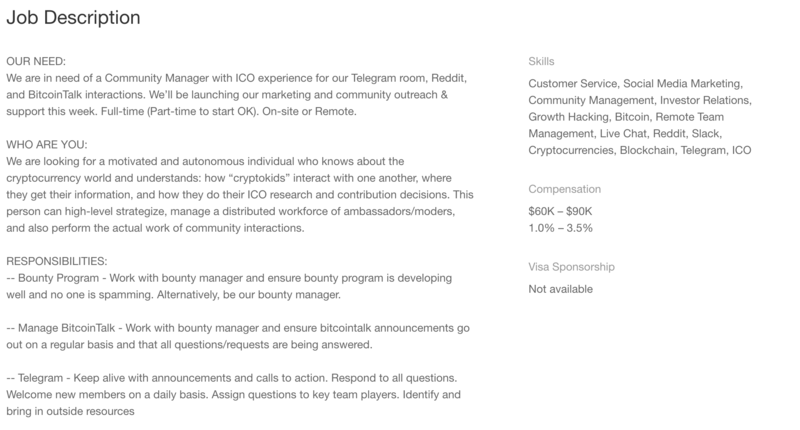 Meanwhile, this role above is for more of a standard front-end developer role for a cryptocurrency startup. It’s much more focused on providing interface work for smart contracts rather than dealing with the on-chain contract work itself. Software engineers will find plenty of blockchain jobs available to them, should they have the right mentality and the thirst to learn more about the sector. Cryptocurrencies are marketed with the strength of their communities. Think of ICOs as a sort of Kickstarter for companies: the strength of your backing community and the network it forms largely determines how much you raise. Most crypto startups will have robust communities focused on Reddit, Telegram, Discord, Slack and traditional social media. Community management roles in blockchain/crypto fall closer to a combination of customer support and marketing. Community managers play a critical role in the marketing of a cryptocurrency startup, both in terms of curating real use cases and in driving early investors or supporters to broadcast updates. A subset of community management involves dealing with high-net-worth individuals who form the bulk of ICO investment, coming closer to investment management. ICO projects will often look at digital marketers to get growth going, both in terms of the whitepaper and product goals but also to get investor interest from the crowd. As you can see with the sample job role, a lot of the marketing and growth work for cryptocurrency startups is related to community management. In general, blockchain and cryptocurrency companies that are looking to get user adoption for their products will need growth marketers and salespeople to help. Blockchain technology is just one part of the fight — user adoption is another. ICOs and crypto startups have to deal with a whole slew of legal issues. One wrong move, and massive fees and legal issues will arise. There is often the need to hire legal help, whether internal or external. This role above is an example of an in-house counsel role. A lot of focus is placed on legal issues specific to cryptocurrency, especially anti-money laundering regulations. There are different types of blockchain and cryptocurrency startups you can work for. There are startups that have created their own cryptocurrency and are building an ecosystem and products related to it. You might think of such startups as Request Network, Quantstamp and more. However, there are many projects outside of just name-brand companies. Every company that is raising money through an ICO is probably hiring. There are startups that use a layer of cryptocurrency to help them carry out key parts of their business. The web browser Brave is an ads-free browser that uses its own cryptocurrency, Basic Attention Token, in order to compensate content creators and aggregators. There are startups, companies, and organizations building their own blockchains or using different blockchains. An example of somebody building their own blockchain is the DFINITY project. There are also popular blockchains such as Stellar and Ripple. There are startups building tools that make it easier for people to exchange, trade and secure cryptocurrencies such as cryptocurrency exchanges like Coinbase, over-the-counter trading tools such as Circle, and cryptocurrency portfolio trackers like Blockfolio. There are also people providing financial services in cryptocurrencies — funds such as Polychain Capital. There are non-for-profit and open source collaborations such as the Ethereum Foundation and Hyperledger. Conventional companies like IBM are looking to hire blockchain engineers to help them understand the space. Finally, there are accelerators or holding companies that co-own multiple cryptocurrency or blockchain ventures and act as a supervising entity. The largest of these is probably Ethereum-based ConsenSys. Most cryptocurrency roles are in certain hotspots: Singapore, San Francisco and Zug Valley in Switzerland, for example. Distributed teams are a force for cryptocurrency startups, with half of all cryptocurrency startups willing to hire for remote roles. You can work for cryptocurrency startups remotely or on contract without having to move through different borders. This is a fitting extension of a technology that aimed to lower borders for transactions of value. You are as likely to work in your own home as in an office located in a cryptocurrency hotspot. The standard startup skillset is essential for blockchain jobs. The archetypes of design, development, and business (hipster, hacker, and hustler) shine through. There is a lot of demand for people who have experience building production-level blockchain projects because it’s a very rare skill set. The ability to work on blockchain projects outside of the Bitcoin Core team has been relatively new. It came with the explosion of Distributed Apps and Ethereum-based applications. The more experience developers have with different blockchains, the better — as the blockchain space is highly volatile, with different blockchains iterating and developing and some vanishing off the map entirely. It makes it much easier to get blockchain jobs if you have exposure to different blockchains. On the business and marketing side, those who have had effective experience running paid ads, and creating organic communities will fit right in. However, cryptocurrency marketing comes with an additional landmine of paying attention to legal and compliance issues. There is a sweet spot for customer service/community management types who can corral the vast organic communities most cryptocurrencies sport on Telegram, Reddit and Discord. Designers are needed for constructing interfaces and what are called “off-chain” applications. In many ways, most blockchain and cryptocurrency startups have the same need for interface designers as your standard tech startup — so there are plenty of blockchain jobs for designers. I’m going to split out here curated learning paths on two dimensions, one focused on the business side of cryptocurrency, the other on the technical part. We’ll have a curated set of learning resources for both. This will make it easier for you to have specific knowledge and examples of the biggest problems encountered in both blockchain and cryptocurrency and help you get a handle on what blockchain jobs require. The Crypto Canon is venture capital firm Andreessen Horowitz (a16z)’s effort to curate some of the best articles on blockchain and cryptocurrency. It goes from building blocks and basics to developer tutorials. This glossary will help you navigate different words and terms in the blockchain space, and will also help you come up with a curated understanding of the non-technical elements of the space. An important part of the blockchain discussion revolves around who controls the blockchain in question and the meaning of decentralization. The following resources will help clarify this topic. This article by Vitalik Buterin, Ethereum’s creator, helps explore what is really meant by decentralization — and helps tease out the differences between centralization on an architectural or technological basis, and centralization in a political structure. This slide deck talks about why governance itself is important, before also breaking down what makes blockchain governance so different from traditional models of governance. Blockchains are pseudonymous by default. Wallet balances are public but not who owns the wallet. They are not completely private unless that is deliberately designed. Anybody who can track down the identity behind a Bitcoin wallet can trace their every transaction. This was how the FBI seized Silk Road’s assets. This article discusses how privacy on the blockchain is an uphill battle and suggests a few key weaknesses in the privacy approach of most bitcoin users. It then suggests a few solutions that might help. Using alternatives to Bitcoin can address privacy concerns. ZCash, a cryptocurrency focused on using zero-knowledge proofs to guarantee privacy writes about how it can prove something is valid without revealing any information about it: the basis of a truly private blockchain. Another major issue is scale: how many transactions per second a blockchain can process. This becomes a major issue as Bitcoin or Ethereum surge in usage but cannot support the number of transactions. Ethereum can process about 13-15 transactions per second, but Visa can process up to 56,000 transactions per second. Looking through how to bridge this gap is an important problem. This article sums up the present state of cryptocurrency scale and then proposes some different solutions that are being actively explored. The Lightning Network is a solution to Bitcoin’s scaling problem. This article talks a little bit about the mechanics behind it and helps explain what exactly a specific solution to a scaling problem (even if it’s off-chain) looks like. If you want a guide to how to think about cryptocurrencies and get in the position to trade with them practically, this guide, while behind an email wall and targeted mostly to wealth advisors, can help you with a broad overview. Note that the author of this piece isn’t making investment advice here and is, well, me. This handy tutorial dives into how you can use Golang to quickly get up a prototype blockchain, helping you to understand the basics needed here. It’s a handy way to dive right into the blockchain industry. This listable I created has many of my favorite resources to learn Solidity, the programming language of choice for applications on Ethereum. It’s a handy resource to getting you blockchain jobs. CryptoZombies is a game that will help you learn Solidity interactively. It remains to this day of my favorite resources to onboard people into the language. Most people compare what is happening to the blockchain and cryptocurrency space to the first Internet bubble. There may a ”mania” right. That creates a more sobering long-term view on cryptocurrency and blockchain. One interesting difference between cryptocurrency startups and regular ones are the difference between being accorded stock options against more liquid tokens. In practice, the CEO, investors, and board of directors have much more control over standard startups and employees. The retention of employees in standard startups (bad) might look stable compared to crypto startups that give their employees liquid tokens they can cash out immediately. One of the biggest strengths of the cryptocurrency boom, the pulling-in of a wave of talented employees with above-average compensation, might come to a screeching halt when things turn sour. This is something to keep in mind as you’re looking for blockchain jobs. As more and more entrepreneurs start trying new crypto startups as a way to raise funding, there will be more talent focused on the sector. However, as crypto prices fluctuate, the sector becomes unstable. Lots of thought needs to be placed on how this affects the broader economy and jobs in cryptocurrency and blockchain. The way you get blockchain jobs and cryptocurrency jobs is often network or referral-based. You may need to know founders of crypto projects to get in. It’s also possible to get in by applying on AngelList or going to cryptocurrency and blockchain events.